Prior to any work beginning, the Granite Unlimited Inc. staff must first meet with you to determine exactly what work you would like to be done and the scope of the project. Meeting with you allows us to provide you the must accurate estimate possible. After receiving an estimate, you will make an appointment at our showroom. We will show you the various stones available that meet your needs. You will then be able to finalize your stone selection and we can finalize the quote you have been given. Granite Unlimited Inc. is experts when it comes to natural stone products. If you have any questions about the product or the process, ask us. We are here to help you select the right product for your home. Bring samples of your wall colors, cabinet finshes, flooring and fabrics with you to the stone selection appointment. This is the best way to ensure the stone color and pattern flows with the decor already present in your house. Upon selecting and inspecting the stone, we will tag it to ensure that is the exact piece that is cut and installed in your home. Once your stone has been selected and all deposits are paid, Granite Unlimited can get started on your project. The first step is to make the template. We will come to your home and create a template for the stone. This includes measuring the space and determining where any cutout will need to be positioned. In order for this appointment to happen, all basework must be installed. 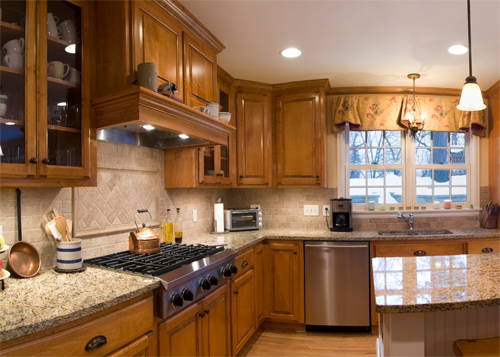 For example, if you are having granite countertops made, the cabinets need to be installed prior to this appointment. Once a template has been made, it will be taken back to our stone fabrication center, where your stone will be cut and fabricated. After the fabrication process is complete, your stone will be ready to be installed. The installation process will take four to six hours, on average. Once installed, a commercial sealant is applied to the stone. This sealant has a one-year warranty. The balance of your project is due upon completion of the installation process. Ready to get started? Call 952-469-5242 now or request a free estimate! Choose from 500 slabs in over 80 colors!